In an ideal marriage or art and commerce, FILA and the New York Collective of the Arts Project are holding their second FILA + NYCOLLECTIVE PROJECT - the Artists Play Two T-Shirt Series this Thursday, August 24 at the company's flagship store in mid-town Manhattan. The project provides a means for artists to showcase their creative work. 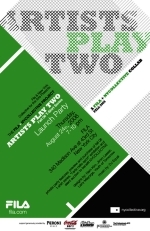 The event will unveil the Fall 2006 t-shirt line, designed by various artists, as well as an auction for tennis-inspired art to benefit the New York Collective of the Arts.